The city of Philadelphia has unveiled a new Pride flag that aims to be more reflective of the LGBT community’s racial diversity. 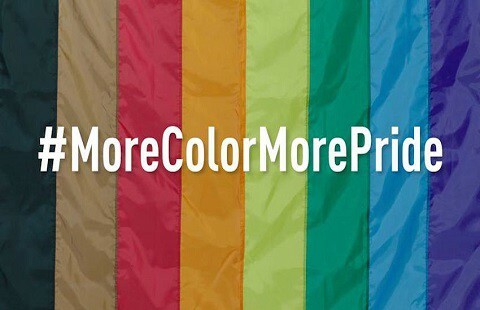 The new flag expands on creator Gilbert Baker’s original design by including black and brown stripes. “I feel that when we celebrate Pride Month and the LGBT community at large, we focus heavily on the same voices, identities and experiences. This year, I want to celebrate people who are too often left out of our narratives. I’m really excited to use this event to highlight people of transgender and gender-nonconforming experience [and] highlight youth and people of color for their contributions to the LGBTQ-liberation movement…. More than 200 people were in attendance last Thursday to celebrate the unveiling and raising of the flag at the north apron of City Hall. Flag designer Tierney and the Office of LGBT Affairs have developed a website where people can download the flag for free. Watch a CBS report below.